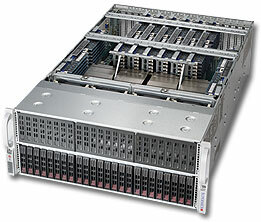 ■ Cost-effective, bare-metal switch infrastructure for data center fabric. ■ 48 x SFP+ switch ports, supporting 10GbE (DAC, 10GBASE-SR/LR) or 1GbE (1000BASE-T/SX/LX). ■ 6 x 40 QSFP switch ports, each supporting 40GbE (DAC, 40GBASE-SR4/LR4) or 4 x 10GbE (DAC or fiber breakout cable). ■ Port Grouping to group 4 x 10G ports into one 40G port at the physical layer for maximum bandwidth utilization, and for 300m optical reach over MMF. ■ Full line-rate Layer 2 or Layer 3 forwarding of 1.44Tbps. ■ VXLAN and NVGRE tunneling support in hardware for network virtualization. ■ Rack mountable in standard 19" racks. Mountable in 21" Open Rack with the Open Rack Switch Adapter. ■ Supports hot/cold aisle with port-to-power and power-to-port airflow SKUs. ■ All ports on front; PSUs, fan tray on rear. ■ Hot-swappable, load sharing, redundant AC or -48VDC PSUs. 12VDC power input option. ■ Hot swappable 4+1 redundant fans. ■ Management: Ethernet and console RJ-45 ports; USB storage port. ■ Compatible with Cumulus® Linux® r2.2.1 and later SwitchOS software from Cumulus Networks™. ■ Compatible with Switch Light OS from Big Switch Networks. The Edge-Core AS5710-54X switch meets the high-performance, availability, and network-scaling requirements of enterprise and cloud data centers. The AS5710-54X provides full line-rate switching at Layer 2 or Layer 3 across 48 x 10GbE ports and 6 x 40GbE uplinks. The switch can be deployed either as a Top-of-Rack switch, or as part of a 10GbE or 40GbE distributed spine, forming a non-blocking folded CLOS data center fabric. The switch is rack mountable in either a standard 19 inch rack, or with the Open Rack Switch Adapter in the 21 inch Open Rack. The AS5710-54X hardware provides the high availability features required for data center operation, including; redundant, hot-swappable AC or -48VDC PSUs or 12VDC power input; fan tray with 4+1 redundant fans; and port-to-power or power-to-port airflow options. The AS5710-54X is an ideal Top-of-Rack switch for virtualized data centers, with its support of VXLAN and NVGRE tunneling functions in hardware.